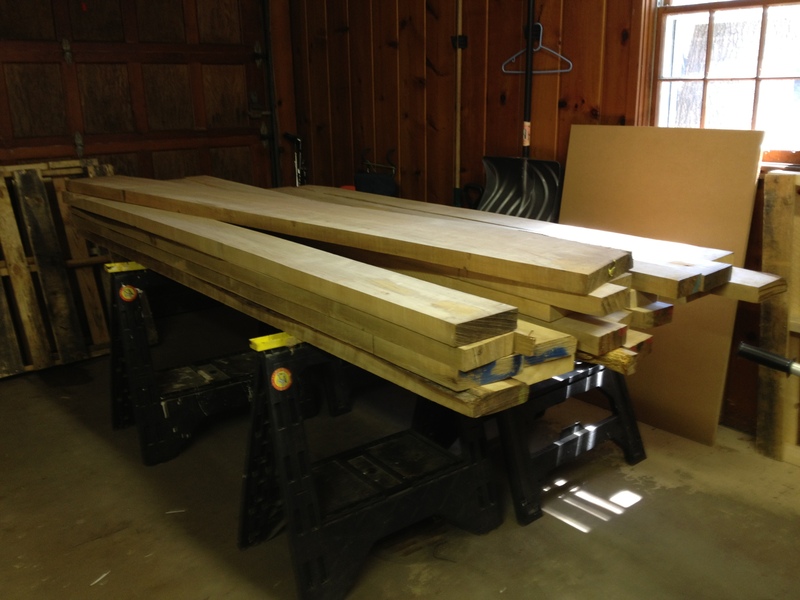 Over the past weekend I finally took the time to take care of a couple of pressing matters – first, I had to make some room in my shop for my recent shipment of 5/4 maple from the folks at Bell Forest Products. This isn’t always easy considering space can be tight in the basement workshop. And given this is easily an extra 700-800 pounds of lumber, I decided I didn’t want to risk overloading my lumber rack since I’m not sure how long it’ll be sitting there until I can start building my new workbench. The second matter I needed to take care of was physically moving the lumber into the basement. This part is actually pretty straightforward. I start by picking it up, one or two boards at a time and carefully navigate it through a couple of doors and down a flight of stairs. I will admit though…about a third of the way through the pile I was really starting to think a garage shop is what I should have instead. After about an hour I finally had everything in place and all this maple is staged up and off the basement floor on a few bricks to help ensure I get good airflow around the pile. Once it was in place I was able to move my tools back into position and it’s time to let the wood acclimate to its new environment. But I have to make a confession at this point. When it comes to acclimating stock in my shop I have a bit of a “do as I say and not as I do” hypocrisy. I frequently recommend that folks bring their materials in the shop up to 2 weeks before they start their project. But the reality in my shop is that I often barely wait a full week before I break into it. This is because I buy my stock from lumber mills that I know take the time to make sure their materials are properly dried before they’re sent out. What this means for me is that the majority of the wood I purchase is practically ready to go as soon as it hits my shop. The moisture content is usually about the same of what I already have in my shop so it’s usually just a matter of resting inbetween unloading and getting started…and apparently I just need a lot of rest after exerting myself that much?! Is that a roubo bench in the rough? That or a Vanderbo lol!!! What was the total board feet of an order that large? I bet this is gonna be a pretty nice bench, are you making it with your own plans? Is it bad that I can’t remember the total BdFt? I think it’s about 100??? As for the plans I think I’ve narrowed it down to one from Taunton, but I’m sure I’ll modify it myself. Nice… Just curious cause I’m getting ready to build a Doug fir roubo as a practice run to see what I like….I like John Tetreaults design with those massive old barn wood pieces and it knocks down easy if you ever gotta move shop…good luck man! Eric, you seem to do things my way…. I too am sometimes bad about letting wood acclimate properly. I am always on both sides of the spectrum. I either bring it home and use it right away or it sits in my shop for a year or two. I also just took delivery on some Bell Forest lumber and am going to try do it right by letting it sit in the shop for the next two weeks. Fortunately I have a few other projects to distract me while I let it acclimate. Looking forward to watching the bench build. I wanted to build a full size bench myself but I just don’t have the room yet. 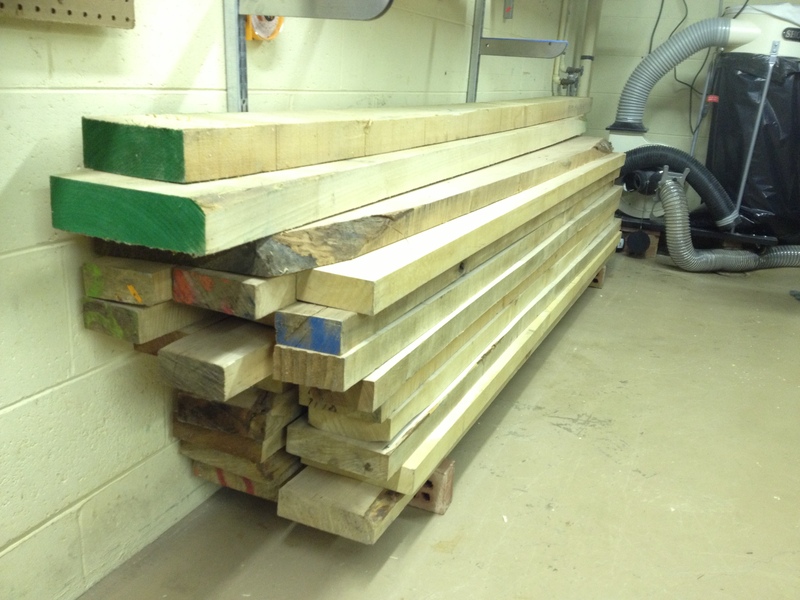 So I am going to settle for a joinery bench for the time being. Plus it’s a good way for me to use a bunch of white oak that has been sitting in my shop for two years. « 511 Resawing on the bandsaw for fun?